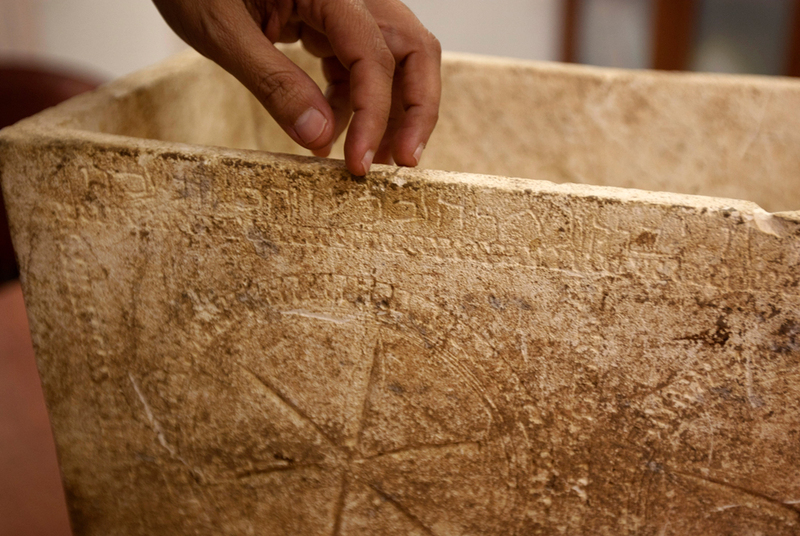 A worker of the Israel Antiquities Authority shows the inscription on a 2,000-year-old ossuary in the IAA offices at the Rockefeller Museum in Jerusalem, Wednesday, June 29, 2011. Israeli scholars said Wednesday they have confirmed the authenticity of the ancient ossuary bearing the name of a relative of the high priest Caiaphas of the New Testament. The ossuary bears an inscription with the name "Miriam daughter of Yeshua son of Caiaphas, priest of Maaziah from Beth Imri." AP Photo/Sebastian Scheiner. JERUSALEM.- Three years ago the Israel Antiquities Authority Unit for the Prevention of Antiquities Robbery acquired a decorated ossuary bearing an engraved inscription. The ossuary was discovered by antiquities robbers who plundered an ancient Jewish tomb of the Second Temple period. During the course of the investigation it was determined that the ossuary came from a burial cave in the area of the Valley of Elah, in the Judean Shephelah. To check the authenticity of the artifact and the significance of the engraved inscription, the Israel Antiquities Authority turned to Dr. Boaz Zissu of the Department of the Land of Israel Studies and Archaeology of Bar Ilan University and Professor Yuval Goren of the Department of Archaeology and Ancient Near Eastern Civilizations of the Tel Aviv University. In the conclusion of their study Dr. Boaz Zissu and Professor Yuval Goren write, the prime importance of the inscription lies in the reference to the ancestry of the deceased  Miriam daughter of Yeshua  to the Caiaphas family, indicating the connection to the family of the Ma'aziahcourse of priests of Beth Imri. Caiaphas is the name of Yeshuas father, and Miriams grandfather. From the wording of the inscription we learn that he belonged to a famous family of priests that was active in the first century CE. One family member, the high priest Yehosef Bar Caiaphas, is especially famous for his involvement in the trial and crucifixion of Jesus. Ma'aziah /Ma'aziahu is the last of the twenty four priestly courses that served in the Temple in Jerusalem. The list of courses, which was formulated during King Davids reign, appears in the Bible in I Chronicles (I Chronicles 24:18). The signatories to the pledge in the days of Nehemiah include among others, Maʽaziah, Bilgai, Shem'aiah; these are the priests (Nehemiah 10: 9). This is the first reference to the Maʽaziah course in an epigraphic find from the SecondTemple period. For the first time we learn from an inscription that the Caiaphas family was related to the Ma'aziah course. The names of other courses, such as Abijah, Eliashib, Bilgah, Delaiah, Hakkoz, Shecaniah, Hezir, Jehoiarib, Jakim (Jakin) and Jeshebeab, are known from historical and epigraphic texts from the SecondTemple period, including inscriptions discovered in tombs. This week, the two scientists published the results of their research, which summarize the importance of the find and confirm its genuineness. The study appears in the Israel Exploration Journal (Volume 61) published this week by the Israel Exploration Society. Ossuaries are small stone chests that Jews used for secondary burial of bones.